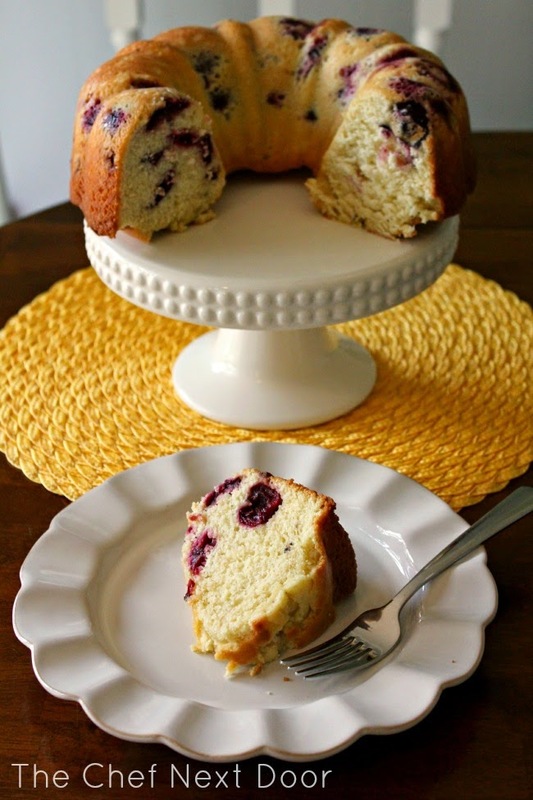 Fresh Michigan Sweet Cherries fill this light and tender vanilla Bundt cake, making one delightful summer dessert! I picked up a big bag of fresh Michigan sweet cherries at the market last week. My kids and I love to just snack on them as is, but I had so many that I knew I wanted to bake with them as well. After taking suggestions from my fans, and thinking long and hard about what to make, I came up with this cake. 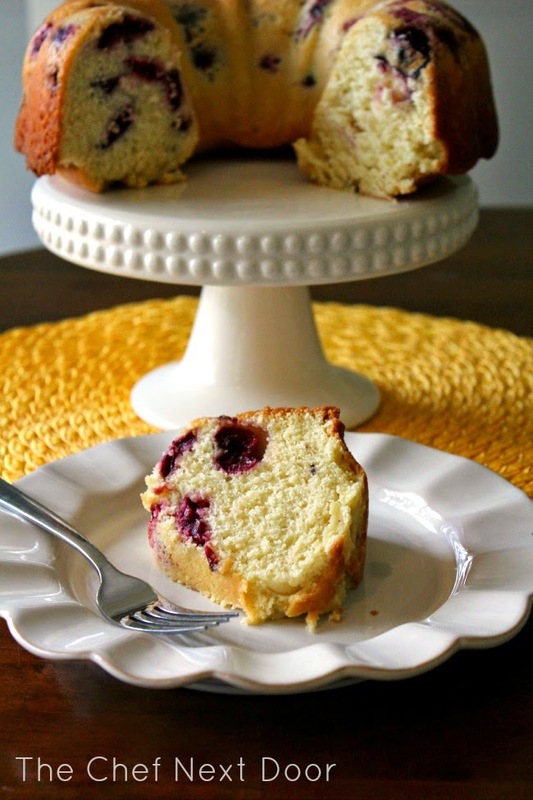 This Bundt cake is light, tender and fluffy and has hints of vanilla. The bites of sweet cherries throughout the cake give it a wonderful little pop. I felt that no icing or drizzle was necessary, but a dusting of powdered sugar would be good if you wish. I left mine as is and it was truly delicious. A little slice of summer on your plate! Preheat the oven to 350 degrees. Spray a 10-inch Bundt pan with baking spray and set aside. Whisk the flour, baking powder and salt in medium bowl. 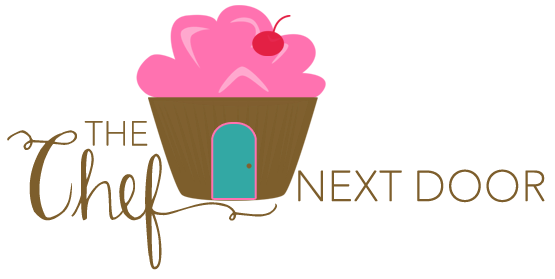 In the bowl of your stand mixer, beat the sugar and butter until light and fluffy and pale in color. Beat in the eggs, one at a time, then the vanilla. Alternately add the dry ingredients and the buttermilk to the batter, a little at a time. Fold in the fresh cherries with a rubber spatula. Pour the batter into the prepared pan. Bake for about one hour, or until a cake tester inserted close to the center of the cake comes out clean. Cool the cake in the pan on a cooling rack for 15 minutes. Carefully turn the cake out onto the cooling rack and allow to cool completely. Once cooled, transfer the cake to a plate or serving platter. Lightly sift powdered sugar over the top, if desired. Slice and serve.